Emergency safety vest for disaster relief. This safety vest is made of durable, bright fluorescent orange vinyl as it is designed to offer great visibility during all safety and work situations. It is ideal for search and rescue operations following earthquakes, hurricanes, tornados, tsunamis, winter storms, terrorist attacks, floods, fires, roadside accidents and emergencies. Perfect to wear during all traffic and emergency events (accidents, roadside emergencies, control situations, etc.) anytime you need to be seen. Don't become a victim! Wear if stranded on the road due to roadside emergencies (accident, need to walk to a roadside call box, change a tire, etc.). Low cost, highly effective, one size fits all. 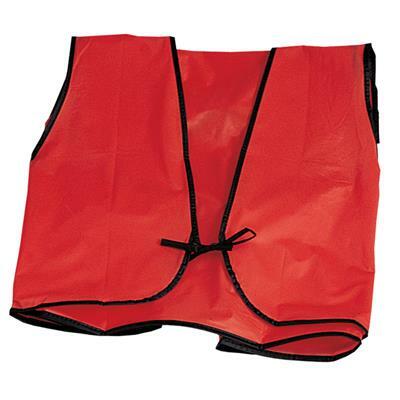 A must for all safety coordinators, floor wardens, crossing guards, highway workers, hunters, etc. Dimensions: 6.75" x .25" x 8.75"
Bright orange for easy identification.